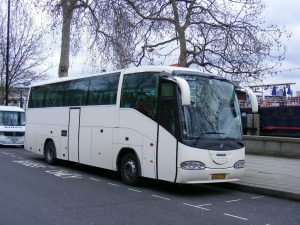 Buses are the one mobile vehicle with the most windows and we provide our services for bus companies as well. We can professionally apply bus window tint at your location without breaking the bank for any size or number of windows. Bus window tinting has multiple advantages. Reflective tinting provides not only lower energy costs but privacy for your customers. Those who ride in your charter buses can travel at ease knowing that the people outside can’t see them sleeping, reading, or talking with friends as they await their next destination. Bus window tinting also deflects solar glare, making driving easier and safer for everyone day or night. The window tint blocks out over 99% of the UV light and the harmful effects thereof. Most importantly, with solar impact diminished, the heat of the sun will never force your driver to run the air conditioning continually once the hot Florida weather strikes again. Professionally applied bus window tinting helps you avoid many of the pitfalls of a DIY job. The hassle of applying the sticky film on countless windows, the air bubbles, uneven coverage–too dark and not legally compliant tinting, etc.–all can be a thing of the past when you choose the experts at Massive Mobile Window Tinting. Reach us at (407) 429-1795 for bus window tinting in Winter Park and Orange/Seminole County. You may also visit our shop at 2721 Forsyth Rd in Winter Park, Florida.